Much of the move towards legalization in the US today may be because of its potential to help prevent epileptic seizures. Probably one of the most popular stories today is that of Charlotte Figi, who saw a drastic reduction of her epileptic seizures brought on by Dravet Syndrome after being administered a CBD oil derived from “Charlotte’s Web” – a strain developed by the Stanley Brothers. We have also spoke to Alexis Bortell, who is an epilepsy sufferer intent on suing the federal government for denying her and others like her from a medication that could save their lives. CBD blocks sodium channels when in high concentrations, and can antagonize both CB1 and CB2 receptors, suggesting it has anticonvulsant properties. Whilst CBD seems to have a weak affinity to CB1 and CB2 receptors, but acts on them indirectly and exerts influence on serotonergic, vanilloid and norepinephrine receptors. We noted above that CBD affects the vanilloid receptors. The vanilloid receptor is also sometimes called the TRPV1 receptor, and is responsible for the detection of pain and heat, and regulates body temperature. CBD may desensitize the TRPV1 receptor, and thereby reduce neuronal excitability. Many people who suffer from epilepsy may have mutations in the liver enzyme cytochrome P450 (CYP450), CYP2C9, CYP3A, CYP2C19, and CYP2D6, which are all enzymes that are responsible for the metabolism of many anti-epileptic drugs (AEDs) like Clobazam. This means that, due to these malformations, many children with certain types of epilepsy may be being given benzodiazepine- and barbiturate- based AEDs that might not even work for them. Many AEDs are also inhibitors of these kinds of enzymes. CBD also inhibits these enzymes, meaning that epilepsy sufferers can get a cannabinoid that’s much safer and more well-tolerated than many AEDs. Taking people off AEDs can be a huge benefit for the epilepsy sufferer – many AEDs have nasty side-effects such as addiction, constant drowziness, nausea, headache, vomiting, fatigue, blurred vision, tremors and death-via-overdose. Also, as CBD is such a powerful inhibitor of CYP450 and other such enzymes, it may have negative interactions with certain AEDs. Epilepsy was also one of the first conditions the medical use of cannabis was tested for in the 70s – prohibition restricted further studies. Ever since Charlotte Figi’s story, however, the research into this area has heated up, with GW Pharmaceuticals looking at creating Epidiolex for rare forms of epilepsy. Several volunteers have reported positive experiences with CBD. 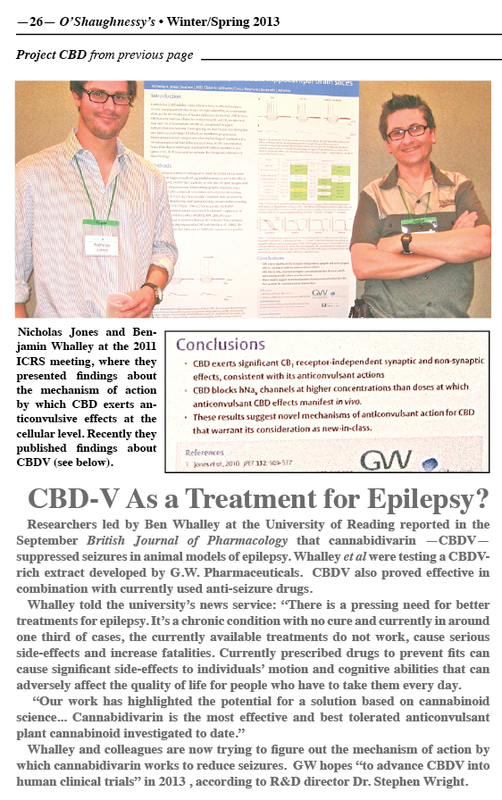 Epidiolex has recently been approved by the FDA, and it seems that there is hard evidence that CBD does help improve seizure control in epilepsy. At the moment, there is lots of anecdotal and empirical evidence suggesting that cannabis could be immensely useful for epilepsy treatment, with several parents reporting a drop in seizures after cannabidiol-enriched cannabis. There are lots of complexities regarding how the endocannabinoid signalling affects epilepsy, but signs so far are showing that,yes, cannabis may indeed be useful for some types of rare epilepsy.